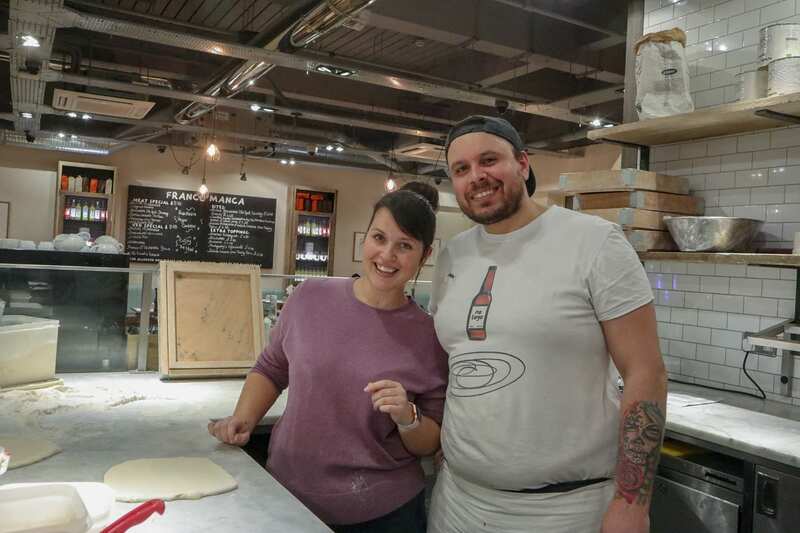 Despite my boyfriend asking me to go for pizza at Franco Manca at pretty much every opportunity he can, I didn’t have any idea about the pizza masterclasses they’ve recently launched. So, when an email dropped in my inbox a couple of weeks ago I laughed and knew instantly that there was nobody else but Steve I could take along. He’d never have forgiven me if I didn’t! He knows the menu like the back of his hand, has a summer favourite, a winter favourite and probably could be blind-tested and know every dip, topping and cheese without hesitation. We’ve been eating here since they very first opened the Reading branch, in 2017. Read my previous review right here! We’ve also got our own ‘starter’ brewing in the kitchen, it’s called Vito. I read somewhere once that’s it bad luck to not name your starter, but we actually haven’t made anything with it yet as we have no idea what to do next! Hence why this class came along at the most perfect time. Does that mean Steve will now be making non-stop pizzas at home? What have I created! For those of you wondering what the heck a ‘starter‘ is, it’s basically the yeast that is the magic behind all things sourdough. You can keep it for years and just take a tiny bit out when needed, whilst feeding it daily with flour and water to keep it ‘alive‘. Franco Manca uses a starter that they call their ‘Mother Yeast’ brought back from a secret source in Ischia, a small island off the Gulf coast of Naples. They’ve have been feeding, sharing the starter between restaurants and using the same one since they opened their very first branch in Brixton in 2008! For me, this is a true testament to Franco Manca’s dedication to making the most perfect pizzas! I love that they’re keeping their ancestor’s traditions alive. It stretches back through time like a family tree and whilst your pizza may only take 90 seconds to bake in a 450-degree pizza oven, it was hundreds of years in the making. In the UK we’re always looking for the next trend, whereas the Italians keep their dishes simple, dedicated, traditional and delicious. After we’d heard all about the history of Franco Manca, we also learnt where their ingredients come from. Nearly every ingredient is either sourced locally to each restaurant, (which is why the menus are seasonal) or from trusted family suppliers in Italy. I was particularly interested to hear about the flour. With so little ingredients needed to make their pizza’s I knew one of the key ingredients would be an excellent flour-blend. The flour *0* is 100% Italian. It’s made especially for Franco Manca by the Pivetti family, using a unique blend of all-Italian grains. The Pivettis have grown, harvested, milled and blended grains in their fields near Bologna since 1895. At last, it was finally our turn! By this point, we’d learnt as much as you can take in and with our tummy’s beginning to rumble, the smell of pizza constantly in the air, there’s nothing better than stepping in that kitchen, popping on your chef’s hat and making your own pizza! Standing behind the counter and seeing the restaurant from the other side, playing with their ingredients and equipment, using a real, molten-hot, wood-fired pizza oven was amazing. Handling the dough, stretching it, working out how much flour to use, kneading, passing between your hands to stretch and shape, sliding it across the counter to throw on your toppings, or in my case neatly arranging because it’s just wrong to have more olives in one part than the other…is so much fun! How I’ve got this far into my post and not mentioned our chef/teacher I don’t know, but our class was taught by the best pizza chef of all pizza chefs – Andrea! Flour was thrown, hands were covered, more toppings were needed, cheese was sprinkled… and sprinkled… AND SPRINKLED…and he didn’t lose his patience once. Every question was answered, every demonstration repeated if needed, he was incredibly patient, diligent and enthusiastic. With the biggest smile, the most welcoming attitude and an amazing Italian accent to match, he made the class what it was. The pizzas themselves were always going to be delicious, but he made the experience so much fun, had everyone glued to every word and fully immersed himself in us learning for the whole 2.5 hours we were there. "(AD) Afternoon Tea at Laura Ashley The Tea Room, Burnham Beeches Hotel"
"Meet the Baker #1 – Michelle from Brown Bear Bakery"